Fish oils have captured the attention of even mainstream medical researchers these days. They are often recommended now to help prevent and even treat cardiovascular disease [1,2]. They are also often used for potential cognitive issues [3,4], stroke prevention , prevention of macular degeneration , and pain relief . Experts have suggested that the consumption of omega-3 polyunsaturated fatty acids, particularly EPA and DHA, may reduce the risk of autoimmune disease, certain forms of cancer, diabetes and arthritis . The American Heart Association's now actually has fish oil guidelines that recommend that patients with coronary heart disease take 1 g/day of omega-3 fatty acids containing 180 mg of eicosapentaenoic acid (EPA) and 120 mg of docosahexaenoic acid (DHA) in the diet or as a supplement . There are many types of fish oil products on the market. The poor ones use farmed fish. The good ones have high contents of EPA and DHA. The better ones come in glass bottles, and do not use pork in their capsules. The best ones also contain oil from wild herring (or similar fish) that has been molecularly distilled to eliminate heavy metal concerns. 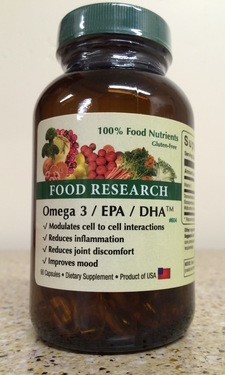 Omega 3/ EPA/ DHA, of course, contains high amounts of both EPA and DHA, comes in non-pork capsules, has been molecularly distilled, comes in glass bottles, and is from wild herring. 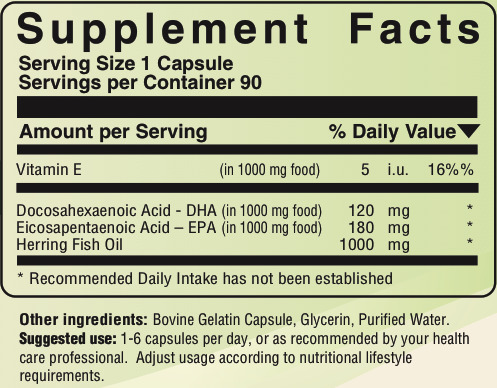 Omega 3/ EPA/ DHA also naturally contains vitamin E.
Docosahexaenoic Acid is most commonly referred to as DHA. DHA, in conjunction with omega 3 fatty acids, has been shown to greatly reduce the risk of age-related macular degeneration  (Complete Eye Health is a good product to also consider for vision issues). One study found that that women who received DHA supplementation had a 20% lower serum triglyceride level, 8% higher HDL-cholesterol concentration, a 28% lower overall ratio of serum triglyceride to HDL cholesterol and a 7% decrease in resting heart rate . One study found that depressed subjects had significantly lower levels of DHA, total EPA plus DHA, and ratios of omega-3 to omega-6 fatty acids, than non-depressed ones . It has been noted that a reduction in the level of plasma DHA appears to be common in the subjects with cognitive impairment with aging , and help those with dementia . One paper concluded, “[T]his study estimates that increasing maternal docosahexaenoic acid (DHA) intake by 100 mg/day increases child IQ by 0.13 points” ; hence there appears to be intellectual benefits associated with DHA. Eicosapentaenoic Acid is most commonly referred to as EPA. In rheumatoid arthritis, there is an accumulation of mononuclear phagocytes, lymphocytes and leukocytes in the proliferating synovial tissue. In a review of 12 randomized, placebo-controlled, double-blind arthritis studies, a dose-response relationship was shown with a daily dose of 2.6 g of fish oil, which is equivalent to about 1.6 g of EPA . A double-blind trial of rheumatoid arthritic patients, subjects consumed 2.7-5.6 g/day of fish oil containing EPA and DHA over a 12-week period, reported significant improvement in tender and swollen joints, grip strength and less global disease activity . There is a published case report of a child who was given EPA at an increasing dose up to 540 mg/day by the end of 4 weeks, and within 1 week after achieving this level, there was a complete elimination of anxiety and agitation . EPA is sometimes used for allergies. A trial involving allergic rhinitis found that EPA suppressed the responses of nasal blood flow and nasal eosinophils to an antigen challenge, which is a good thing, but this did not show any clear symptomatic benefit . Higher levels of EPA appear to be correlated with improved bone density . Herring Oil naturally contains DHA and EPA (and Omega 3/ EPA/ DHA has been tested to demonstrate that). Herring are one the richest sources of EPA and DHA . Herring themselves are a type of small cold water fish. Small fish spend less time in the water than large fish and are preferred by many natural health professionals. Herring are a fish very high in omega 3 fatty acids , and may be the highest natural Food source of EPA . One study concluded, “Omega-3-fatty acids are in fatty fish like…herring and improve survival after myocardial infarction. They improve among others endothelial function (adhesion molecules)” . The PDR reports, “Supplemental fish oils have triglyceride-lowering activity…Meta-analysis of 17 controlled studies with fish oil indicates that supplementation with 3 or more grams of fish oil daily can lead to clinically relevant systolic and diastolic blood pressure reduction in individuals with untreated hypertension…with an EPA to DHA ratio of about 1.5” . The herring oil in Omega 3/ EPA/ DHA has a 1.5 EPA to DHA ratio. Omega 3 fatty acids are considered to be highly effective in pain control , with EPA and DHA being of the most preferred omega 3 fatty acids. One study recently concluded, “Our results mirror other controlled studies that compared ibuprofen and omega-3 EFAs demonstrating equivalent effect in reducing arthritic pain” . It is also used for cardiovascular concerns, as some blood pressure randomized studies have confirmed that omega-3 fatty acids may reduce systolic blood pressure by 5 mmHg and diastolic pressure by 4 mmHg . The doses that may cause antihypertensive and antithrombic effects is 2 to 4 gm per day. Omega-3 fatty acids can reduce triglycerides in the therapeutic ranges between 1 and 24 gm per day . The western diet has a lower intake of omega-3 fatty acids, and an excess intake of omega-6 fatty acids and trans fatty acids. There is much evidence that omega-3 fatty acids have antiinflammatory effects that may alter immune responses, and their reduced dietary consumption may be involved in the increased incidence of allergy . It has been reported that consumption of omega-3 fatty acids along with a low glycemic diet may also have a synergistic effect for reducing the risk of acne . Wild fish contain more higher amounts of omega-3 fatty acids than farmed fish . All Food Research products, including Omega 3/ EPA/ DHA, which contain fish or fish oil, use only wild fish. Vitamin E is an important nutrient and antioxidant . Vitamin E is naturally present in Omega 3/ EPA/ DHA. For a molecularly distilled, wild herring fish oil product, high in both EPA and DHA, that contains no pork, and comes in glass bottles, the choice of natural health professionals is Omega 3/ EPA/ DHA. Omega 3/ EPA/ DHA naturally contains those nutrients found in molecularly distilled Herring oil. Food nutrients are better because they contain important enzymes, peptides, and phytonutrients CRITICAL to the UTLIZATION of vitamins, and minerals which are not present in isolated USP nutrients. Published research has specifically concluded that food vitamins are SUPERIOR to synthetic/USP vitamins. Suggested Use: 1-6 capsules per day, or as recommended by your health care professional. Adjust dosage according to nutritional lifestyle requirements.